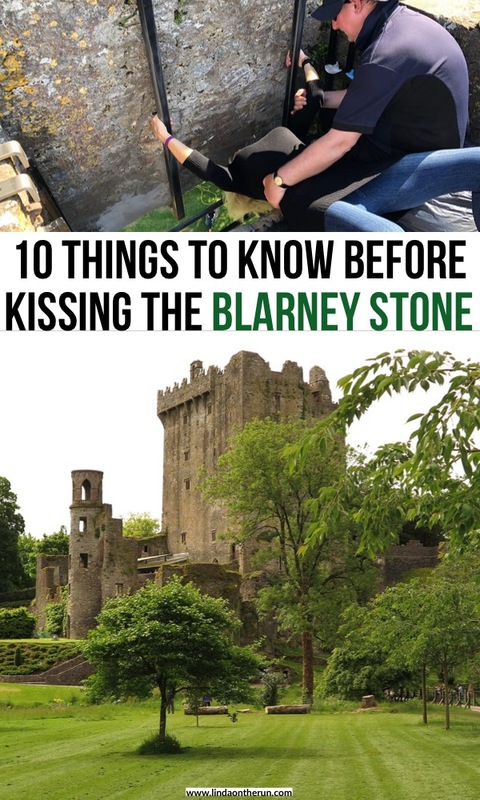 Do you plan to kiss the Blarney Stone during your next trip to Ireland? Are you looking for information to help you plan your visit to Blarney Castle to kiss the Blarney Stone? Well, look no farther, because, on my last trip to Ireland, I had the unforgettable experience of visiting Blarney to kiss the Blarney Stone. 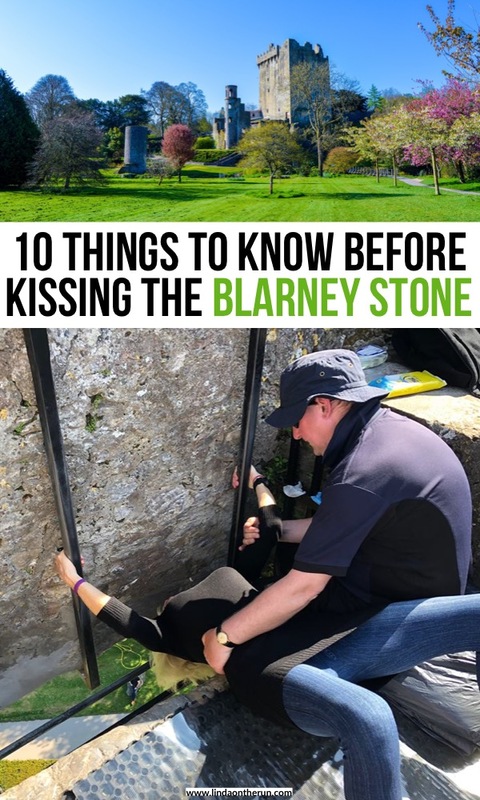 Did you know that after you do kiss the Blarney Stone, also referred to as the Stone of Eloquence, legend has it you will be bestowed with the gift of gab, and people have been visiting Blarney for over 200 years to kiss the Blarney Stone. Kissing the Blarney Stone was a dream of mine and one of my two top priorities for my trip to Ireland. I want to share my incredible experiences with you so you will be better prepared than I was when you kiss the Blarney Stone! The very lovely and legendary Blarney Castle, home of the Blarney Stone. This would be my number one recommendation and tip. Set aside a large portion of your travel day to spend at Blarney Castle, because there is a LOT MORE to do than just kiss the Blarney Stone! Set on sixty acres, Blarney Castle’s grounds are nothing short of stunning. There are gardens to explore, walks to take, and streams to rest near. You will want to have ample time to wander the grounds and see as much as possible while you are there visiting. Unfortunately, this was not my experience. 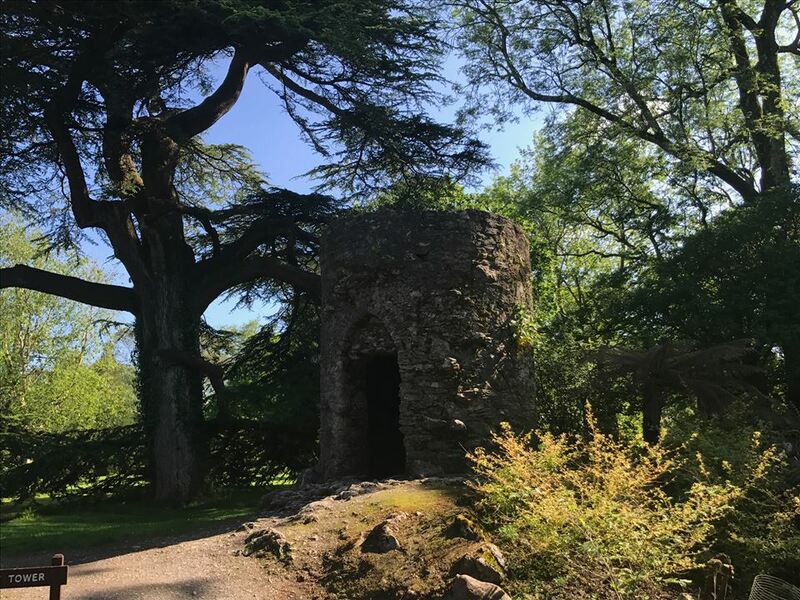 I was not aware of the beautiful property that the Blarney Castle was nestled in, and the rich history there to discover and felt rushed and a bit disappointed when my family and I left because we did not budget enough time. Please do not make our mistake! Here is my daughter Victoria, heading up to explore the Blarney Castle manor house. There is so much to explore, so make sure to budget enough time. Blarney Castle is located in the charming town of Blarney, about 5 miles outside of Cork, Ireland. You will be charged a parking fee if you park on the grounds of the Blarney Castle. If you so desire, you can park in the city of Blarney itself, a mere block or two away, and it will be free. It was a crowded afternoon when I visited Blarney Castle with my family, and we were still able to find a parking spot about one block away. There is an admission fee to enter Blarney Castle and the accompanying grounds. We definitely would have saved time if we had already bought our admission tickets instead of having to wait in the line to get them upon arrival. And of course, we could have saved money too, for getting them online saves money. There is always something new to discover on the grounds of the Blarney Castle. Upon our midmorning arrival, my family and I headed straight for the Blarney Castle to fulfill our dream to kiss the Blarney Stone. That turned out to be an unfortunate decision for us because the line was extremely long and it took a very long time for us to get to the stone. A few hours later, as we wandered and explored the grounds of the Blarney Castle, we noticed there was NO LINE at all. So, please learn from our mistake, meander around the grounds, and enjoy all the gardens and streams, and kiss the Blarney Stone a bit later on in the day. You will also have better success and skip the long line to kiss the Blarney Stone if you arrive early in the morning before the crowds arrive. Please advised, it is no small task to actually get to the top of the Castle to kiss the Blarney Stone. You will have to climb a somewhat steep winding staircase to get there. I know of no accommodations for the disabled or those in a wheelchair. 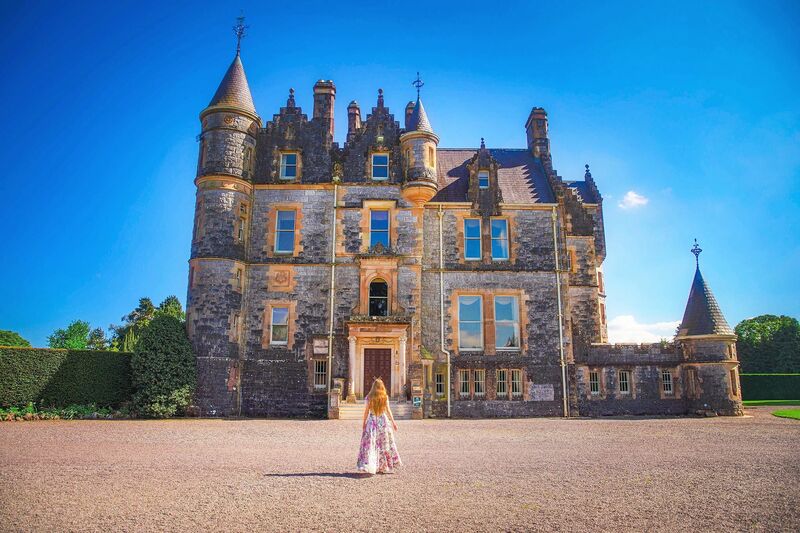 Along the staircase, as you are climbing to the to top, there are magnificent and spectacular views of the Blarney grounds and the adjacent Irish countryside that will take your breath away. Have your camera or cell phone ready to capture some of the most memorable Irish vistas around. An outside view of Blarney Castle. 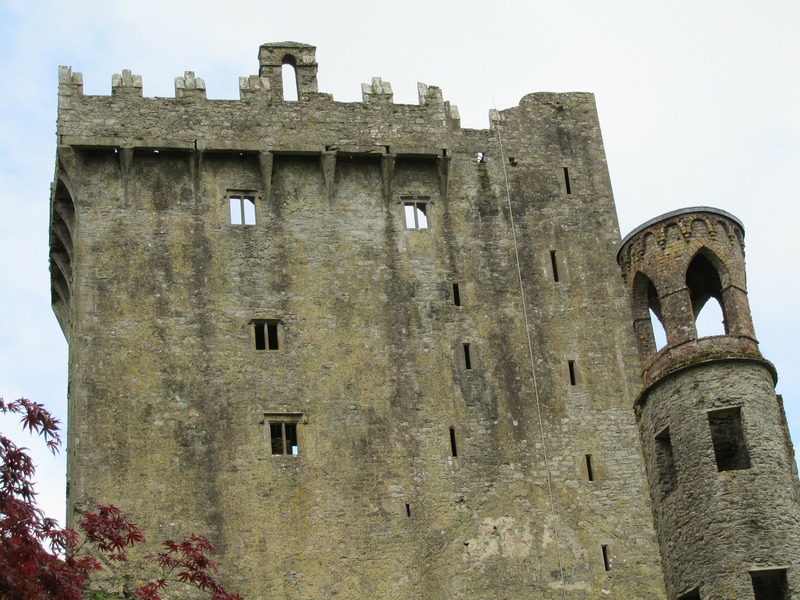 You will climb a steep winding staircase to get to the top to kiss the Blarney Stone. Soon enough, you will emerge from the winding staircase to the openness and vastness of the rooftop of the Blarney Castle. You will still have a short walk of about 50 paces until you get to the stone. Use that time to look at the absolutely stunning scenery of Ireland that is all around you while you get palpably excited that your turn to kiss the Blarney Stone is near. Picture taken atop Blarney Castle. 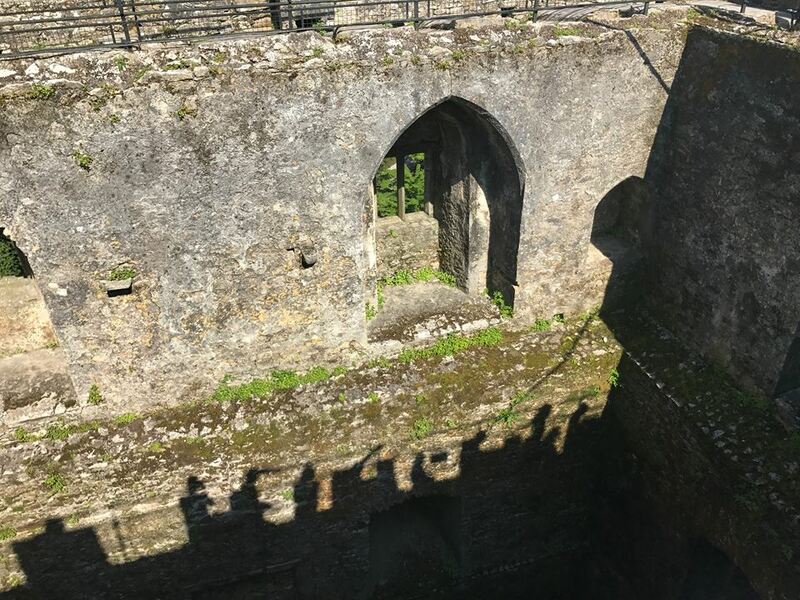 Shadows are people waiting in line to kiss the Blarney Stone. So, finally, it is your turn to kiss the Blarney Stone. Do not worry one bit, as there are several assistants there to help you. First off, give your camera to your family or one of the Blarney assistants, because you do not want to let this moment you have been waiting for go by without documentation. The assistants will help you to sit down first of all. Take your time. They are there to help you and keep you safe. It will be a touch intimidating I know. I was a wee bit overwhelmed myself, but do not give up. You can do it! Here I am getting into position to kiss the Blarney Stone. There is an assistant to help me. I am happy my family got this picture of me. I look so overwhelmed. Next, you will lie down and resituate your body closer to the ledge where the Blarney Stone is. Ask the helpers exactly which stone is the Blarney Stone, so you know where to put your head and neck. The assistants will give you guidance and help. And then finally, tilt your head back, and kiss the Blarney Stone to never be lost for words again in your life. At least that’s what the legend promises. Your family will be snapping pictures of you and you will enjoy them all afterward. Here I am backward with my head upside down, to kiss the Blarney Stone, a dream-come-true for me. You can see the antimicrobial wipes in the upper right corner of this picture. They will swipe the stone if you ask. The assistants will complete their jobs by helping you first sit up, then finally stand up and help you move along as they prepare for the next person. Please know that those working so diligently right at the Blarney Stone to make sure you have a wonderful experience when you kiss the Blarney Stone will wipe it clean with an antimicrobial wipe before you kiss it if you request. I brought my own wipes with me, but they declined and used their own to swipe right before it was my turn to kiss the Blarney Stone. The lovely grounds of Blarney Castle estate. You will probably want to stop and rest during your meandering of the Blarney Castle grounds sometime during your visit there. The Stable Yard Cafe is the place to go. 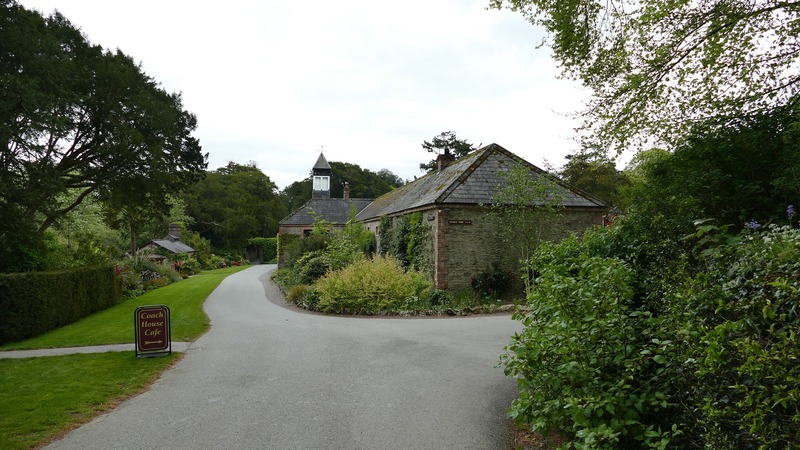 Located in an old stable near the manorhouse, the cafe has its own interesting history to share with you. Snacks and drinks and light meals are available for you to enjoy. The lush grounds of the Blarney Castle estate. Located on your way out, with exceptionally charming associates, the Blarney Castle Shop is your last place to visit to cap off the eventful day you kiss the Blarney Stone. You will find postcards galore for family back home, lots of quirky and interesting items for guys and gals, and many options for souvenirs and mementos to remember your visit to kiss the Blarney Stone and wandering the gardens and streams of the Blarney Castle. To kiss the Blarney Stone for the gift of the gab is an unforgettable and very unique experience. I hope you use my tips above to have a great and leisurely experience as you plan your trip to kiss the Blarney Stone. 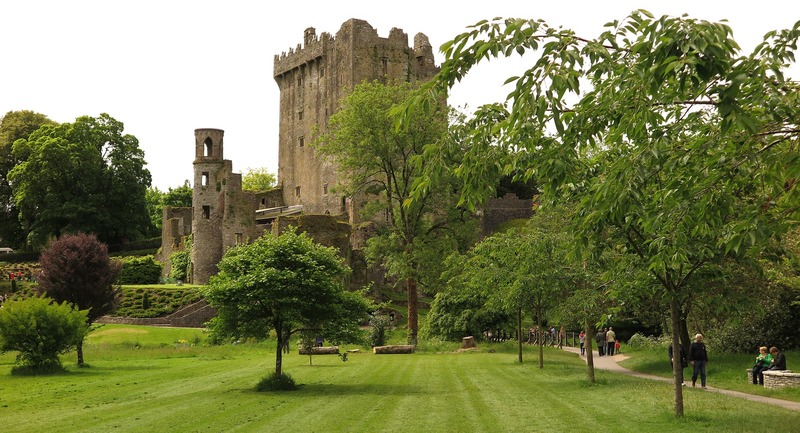 Have you ever been to Ireland and made the trip to Blarney to kiss the Blarney Stone? How was your experience? Please leave a comment below to share your experience. Do you now speak eloquently with the gift of gab? It was also my mission to kiss the Blarney Stone on my last visit to Ireland and could have done with your blog post before going. We got there super early so didn’t face a massive queue but as we were visiting en-route to Dublin we also didn’t leave enough time to fully explore everything. I also never got my picture as I wrongly assumed you pick them up in the exit gift shop. I guess I’ll have to go back someday! See? 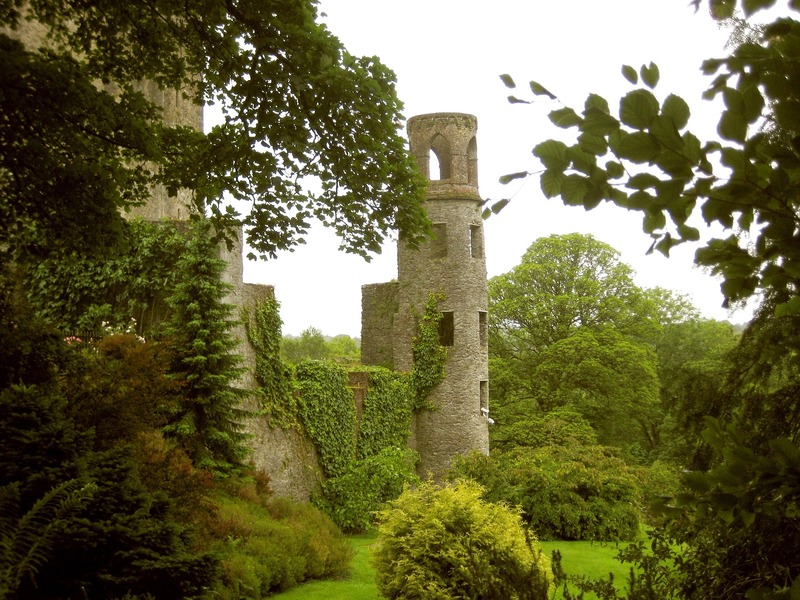 Like us, not many realize there is so much to do on the grounds of Blarney Castle. At least you now have “the gift of gab” after kissing the stone backwards & upside down! It looks so fun, I shall have to go. Thanks for the info. I kissed the Blarney Stone too 🙂 I didn’t expect to have to do a full back bend in order to kiss it! But, I did it! WOO! Mission accomplished! I also had no idea there was so much to explore on the castle grounds. We kissed the Blarney Stone while on an organized tour and were on limited time. Going back and will definitely tour the grounds. Yes. I encourage everyone to ask to have the stone wiped. Thanks for all the wonderful tips Linda! What time of year did you visit Blarney Castle? We went in late May. It was not too hot and a great time of year. My daughter and I were on a group tour. We kissed the Blarney Stone and were able to explore the grounds, magnificent!. My favorite was the Poison Garden. Hope to go back. I kissed the Blarney Stone on my birthday last year! It was such a fun experience, one of my best birthdays ever! My mom and I were in Ireland for the first time and we were both a bit nervous as we are both scared of heights. We fought through our fear and both kissed the stone, an experience we will never forget! And they did take our photo and we bought it in the gift shop. What a wonderful memory. I love that you travel with your mom. That is very cool! My wife and I took the time to kiss the stone, what a great time. We spent over 7 hours walking the grounds and were glad we did. There was still more to see and the manor house was closed for renovations. soooo… guess I’m gonna have to go back and spend another day or two there! !